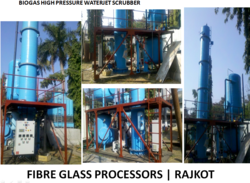 Prominent & Leading Manufacturer from Rajkot, we offer biogas high pressure waterjet scrubber. Area to be Covered 10000 sq. ft.
We are manufacturing FRP Waterjet Scrubbing system for purification of Biogas. we also remove moisture from the scrubber gases. the system is comapct design requires minimum of the space. water requirement is very low- as we re-use the water. the efficiency of the FGP make Waterjet Scrubbing System is 85% more.